During the hearings for Justice Kavanaugh, there were charges that he was too political or too biased in one direction. The implication was that Supreme Court Judges should not be political. That is a reasonable standard, but is it applied evenly? 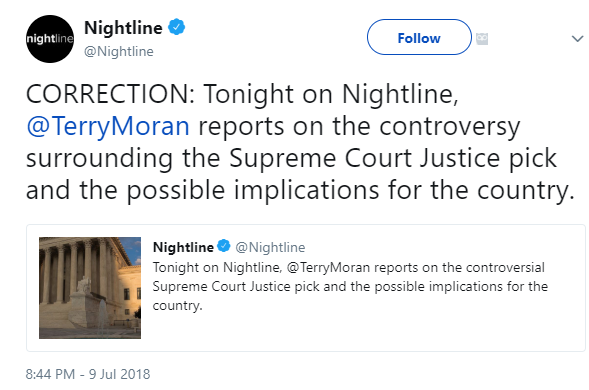 …That same evening on Univision’s national evening newscast, Sotomayor was featured bashing the Federal Government’s massive response to Hurricane María in Puerto Rico. She even prefaced her criticism that “help…is not being received” by acknowledging she was wading into political matters. …Evidently for Sotomayor, the fact that following Hurricane María Puerto Rico was the object of the largest disaster commodity federal response and the largest generator installation mission in U.S. history was not enough, nor was the fact that the U.S. Department of Housing and Urban Development alone has allocated to Puerto Rico $20 billion in Community Development Block Grants, a figure more than twice the size of the U.S. Caribbean territory’s annual budget for its entire government. The problem in Puerto Rico was not the amount of aid–it was the corruption involved in distributing the aid. FBI agents raided municipal offices in San Juan, Puerto Rico, on Tuesday, seizing documents and digital records as part of an investigation into fraud allegations related to the city government. Special agent in charge Douglas Leff said federal investigators are also looking into potential obstruction of the investigation. According to Leff, agents believe documents tied to the reported irregularities in the city’s purchasing procedures might have been taken from the building or falsified. If Justice Sotomayor is going to get involved in politics, she should at least do us the courtesy of getting her facts right. The problem is not the Trump administration–it is the corruption in Puerto Rico. I suppose we should all be grateful that they at least corrected their initial statement. A praiseworthy statement from The New York Times. It has been widely reported that the terrorist who ran over people with a truck yesterday afternoon shouted “Allahu Akbar!” I think that might be an indication of what his motives were. Newsbusters posted a story today illustrating how some of the media chooses to overlook the obvious. Hardball host Chris Matthews brought Nance into the conversation on Tuesday night’s program, asking him about the trend of terrorists using vehicles to go on their violent rampages. Nance responded that it was nothing new, and had been employed by terrorists in Israel dozens of times already. I’m sorry, Mr. Nance, I don’t remember the last time Christians were responsible for terror. I know sometimes Christianity has been blamed for terror, but there is nothing in the Bible that condones terror. The Quran, on the other hand, has many verses that encourage the killing of infidels. It wasn’t their Catholic theology that encouraged them to become terrorists–it was the Islamic theology they converted to. Jihad, waging war on infidels, is part of Quranic Islam. We ignore that fact at our own risk. The so-called counter-terrorism expect is lying. He is lulling Americans into a false sense of security by saying that Islam is not responsible for yesterday’s terrorist attack. It is time to begin to look at what is being taught in America’s mosques. Constitutionally we cannot interfere with anyone’s freedom of religion, but when that freedom becomes a vehicle to encourage terrorism, we need to know who is involved and what they are preaching. I have watched Fox News since it arrived on my cable system many years ago. I appreciated Brit Hume, Tony Snow, and watch Bret Baier. The discussion panels up until the past year have been informative and smart. There was also a reasonable balance of liberal and conservative points of view. Starting somewhere last year, there was a change. I am not a Trump supporter, but even I winced at some of the things said about Donald Trump during the week and on the weekend shows. The clips I heard from the other networks were no better. Well, today NewsBusters confirmed my suspicions. The difference between liberals and conservatives is still significant when you include anti-Trump GOP guests. While Fox and CNN had equal numbers of Republican and Democratic guests, ABC, CBS and NBC had nearly three times the number of liberal guests (36) compared to either pro or anti-Trump Republicans (13). The purpose of having four participants is to encourage a wide variety of views in the discussion. By stacking these discussions with liberal journalists in addition to outright Hillary and Sanders surrogates, the networks are steering the narrative in a particular direction. ABC’s This Week with George Stephanopoulos, CBS’s Face the Nation each only had one Trump supporter during that entire time period, meaning that they each had three out of four roundtable discussions with no representative of the presumptive GOP nominee. NBC’s Meet the Press only had two during that time period. This lack of Trump supporters remained unchanged during the Sunday shows on May 29, after Trump had clinched the 1,237 delegates needed to earn the GOP nomination. In contrast, CNN’s State of the Union hosted by Jake Tapper featured a Clinton Supporter, Sanders supporter, anti-Trump GOP guest and a Trump supporter consistently on all three of his shows which included panels (his show on May 29 consisted of an hour-long interview with Florida Senator Marco Rubio). 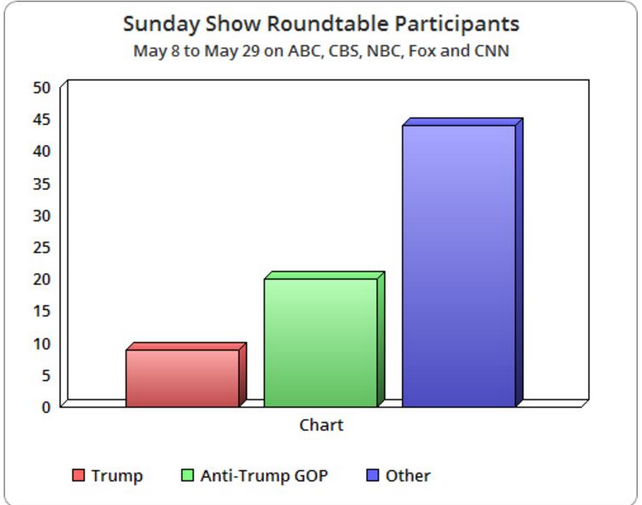 Each Sunday show broadcast had a roundtable discussion with four pundits or journalists, adding up to a total of 73 roundtable participants over a four week period between the five shows. The only exceptions were ABC’s This Week with George Stephanopoulos on May 8 which had five guests, CBS’s Face the Nation on May 8 which had eight guests, and CNN’s State of the Union on May 29 which did not have a roundtable discussion. During the same four weeks, there were nine pro-Trump participants: Tom Cole, Bill Bennett, Matt Schlapp, Kellyanne Conway (twice), Michael Needham, Jan Brewer, Andre Bauer and Marsha Blackburn. So where do you go to become an informed voter? If you have an internet connection, you can go to alternative news sources. NewsBusters is a very good example of one. But that is not really the point. The media should not be cheerleaders–they should report the news as it is. If they have a bias, they should be open about it from the beginning. People who listen to Rush Limbaugh, Sean Hannity, and Mark Levin understand that they are hearing the conservative point of view–first because they represent an informed audience, and second because the point of view of the show’s host is stated. I would love to see that sort of honesty from the mainstream media. The American voter is not informed, particularly the younger generation. They are not taught history in school, and they learn about current events through unreliable sources. Thomas Jefferson understood the value of education. He stated, “If a nation expects to be ignorant and free, in a state of civilization, it expects what never was and never will be.” Neither our schools nor our press is keeping the voting public informed. Unless that changes, the America we all love will be no more. Newsbusters is reporting tonight that the producer who created the altered recording of George Zimmerman’s 911 call has been fired. The network is refusing to name the producer, but has fired him. The people with direct knowledge of the firing characterized the misleading edit as a mistake, not a purposeful act. I have no way of knowing whether the editing was done on purpose or whether it was accidental. I do know that it painted Mr. Zimmerman as a racist when there was no actual evidence to support that charge. Because of the way the tape was edited, Jesse Jackson, Al Sharpton, and other professional racial complainers got involved in something that was totally the result of editing a tape in a way that was thoroughly misleading. 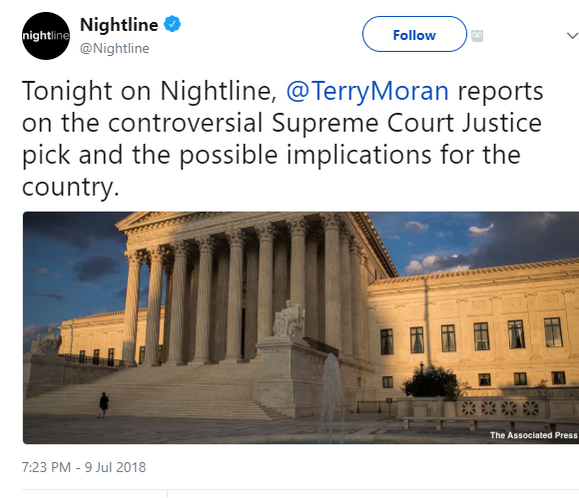 Thank God for the fact that NewsBusters caught on to what was done and spoke up. This story is another example of why we need the Internet. All media needs to be held accountable (even the Internet). Generally it is the Internet that holds the mainstream media accountable, but I am sure there are examples of the reverse.